Because water is a no-calorie beverage, you'll lose weight if it's all you're consuming. The number of pounds you drop may vary depending on the length of your fast. A water fast probably won't lead to long-lasting weight loss, however. Consult your doctor before doing any type of fast to discuss risks and benefits. Fasting may have started as a religious ritual, but it has become a trendy weight-loss diet that's also touted as a detox diet to rid your body of toxic substances. On a water fast, you abstain from all solid food and ingest nothing but water. The length of a water fast varies and can last a few days to a few weeks, according to a 2008 article in Today's Dietitian. To lose weight, you need to shift your calorie balance so that your body is burning more calories than you're taking in. On a water fast, you're not consuming any calories and, therefore, able to create the deficit required to lose weight. You need to reduce your caloric intake by 3,500 calories to lose 1 pound. The amount of weight you lose after a water fast depends on how long you're fasting and your typical caloric intake. For example, if you normally eat 2,000 calories a day and fast for three days, you may lose almost 2 pounds during your water fast. However, when you lose weight too quickly, more than 2 pounds in a week, you may not be burning those unwanted fat pounds; you'll lose muscle and water instead. Muscle is one of the biggest calorie burners in the body, according to the McKinley Health Center, so losing muscle decreases your body's calorie-burning capabilities. 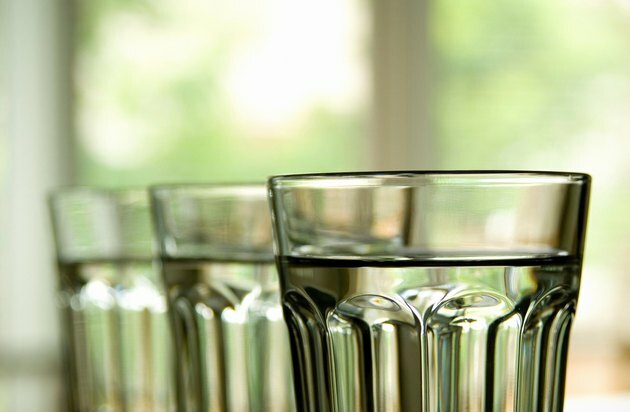 Water fasting may sound like a good way to lose a few pounds quickly, but it's not the best way to go for a number of reasons. When you severely restrict your calorie intake, your metabolism slows down as much as 30 percent, says McKinley. This means your body is not burning as many calories as it does when you're eating, making it harder for you to lose and keep the weight off. A water fast may also not be very good for your health. Not getting any calories for an extended period of time can make you tired, affect your ability to concentrate and cause hunger pangs. Water fasting isn't safe for people with certain medical conditions. A water fast is dangerous, and even possibly life-threatening, for people with diabetes. It's also not healthy or safe for teens, the elderly, people who are already underweight, or women who are pregnant or breast-feeding. A water fast should not last longer than three days unless you're at a medical facility, according to Dr. Michael Klaper, writing for the T. Collin Campbell Center for Nutrition Studies. Fasting for any great length of time affects blood pressure, heart rate, electrolytes and other body functions, which needs to be closely monitored by health care professionals. Klaper says most medications, except thyroid hormone replacement, should be stopped during a water fast. Therefore, anyone who takes a required daily medication shouldn't attempt a water fast. To prevent stomach upset after a fast, you want to ease back into eating. Start with juice, then add fruits and vegetables, such as watermelon, apples, steamed carrots and leafy greens. As your body readjusts to the solid food, you can reintroduce rice and other grains, beans and meat. It may take up to four days to get back to your usual eating habits after following a three-day water fast, according to the International House of Prayer. Instead of going on a short-term water fast to lose weight, you're better off following a healthy, reduced-calorie diet and drinking a tall glass of water before you eat. A 2010 study published in Obesity investigated the effects of drinking 2 cups of water before each meal while following a calorie-controlled diet in a group of overweight and obese people. Over the 12-week study period, the water drinkers lost more weight -- 4 pounds more -- than those who did not drink the water before meals. The researchers reported that drinking water before eating helps you feel full so you eat less.